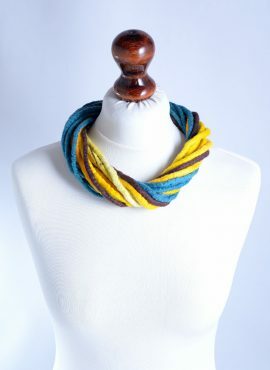 Warm necklace made of hand dyed merino wool in yellow, blue and light green. The necklace is thick but light weight and cozy one of a kind piece of jewerly. Blue wool necklace made of fine and soft merino wool. This multistrand fiber necklace was created in wet felting technique and consists of twisted rope. Green felted necklace made of merino wool fibers can be a great gift. Thanks to its special clasp you can make it a few centimeters longer or shorter. 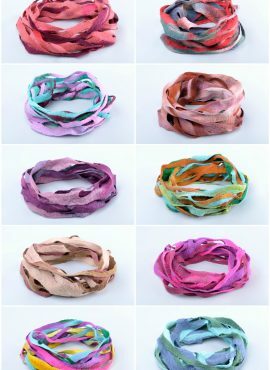 Natural infinity scarves with airy design made in wet felting process. I made these scarves of soft Australian merino wool, so they are eco- and skin-friendly. 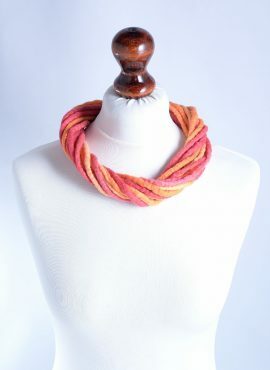 Felted wool necklace in red and orange with multi strand noodle design. 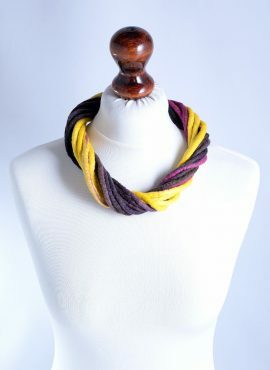 This original and modern necklace is hand made of soft merino wool. Twisted wool necklace with original design made of hand dyed fine merino wool. It was created in wet felting technique and consists of felted ribbons. 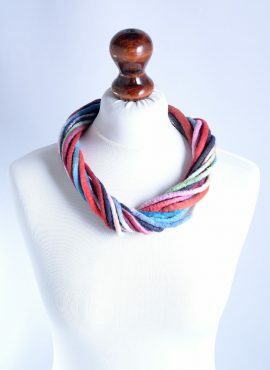 Bohemian felt necklace with original twisted design made of soft merino wool. This fiber necklace consists of many hand felted and twisted ropes. This one of a kind necklace has a clasp in silver color. Thanks to its twist design this modern rope necklace is a beautiful piece of jewelry. 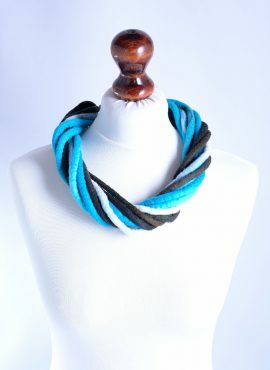 Felt modern necklace with twist rope design. This minimalist fiber necklace is made by hands in wet felting technique out of soft Australian merino wool. Twisted rope necklace in azure and lime made in wet felting technique. This warm twist necklace is hand felted of natural merino wool and is one of a kind. Eco bohemian necklace made of soft and cozy merino wool. 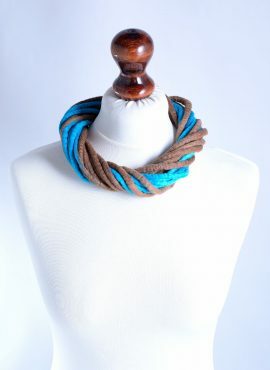 This eco-friendly fiber necklace consists of felt rope gathered into a multi strand bundle. This twist rope necklace is one of a kind piece of jewerly. Thanks to its candy colors and lovely, trendy design it is perfect for teens. This ethnic felt necklace is made by hands out of merino wool in wet felting process. It consists of felt rope gathered into a multi strand bundle. Wool rope necklace designed to wear with linen clothing. The necklace is made by hands out of felted merino wool in yellow, lime, pistachio and brown. Marine necklace with twist design made by hands out of felted merino wool. The necklace has a few metal eyelets, so it can be adjusted in each direction. This dark pink necklace in boho style is really unique piece of fiber jewerly. The necklace is made by hand of natural and soft merino wool. Fiber ribbon necklace made by hand in pastel colors. 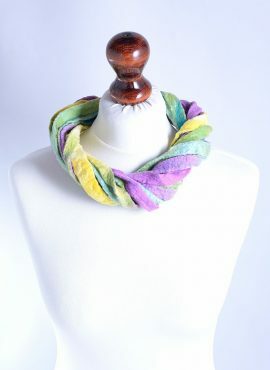 This cheerful spring necklace with twist ribbon design is felted of fine merino wool. Necklace made of wool. Thanks to its well matched colors and twisted design this tribal rope necklace is a perfect piece of women jewelry. Felted ribbon necklace with twisted design made of hand dyed wool in blue and yellow shades. This necklace was created in wet felting technique.